The Comprehensive Energy Audit is the best method to determine the full scope of issues affecting your home’s energy performance and efficiency. This audit is a detailed inspection of your entire home focusing on all possible areas of energy loss. 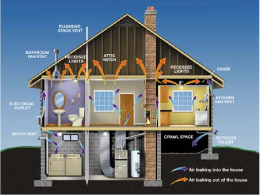 The Comprehensive Energy Audit covers doors, windows, walls, roof, insulation, heating and air conditioning equipment. Included in this evaluation are the Blower Door and Duct tests. A thermographic camera will be used as needed to help determine problem areas. An inclusive report detailing our findings and providing recommendations for improvement is provided.